My husband and I are expecting our first baby!!! As this is my first pregnancy, I was completely caught off guard as to how incredibly sick I would be during the first trimester. I mean SICK. I could not look at food, smell food or even think about food the entire first trimester. UGH! Basically the only food I could keep down was pizza, pasta and the occasional taco. For the first time in my entire life, I could not eat vegetables. Me, a former life-long vegetarian, could not eat/look at/think about vegetables. It was insane. I couldn’t even visit my favorite food blogs because I couldn’t read about food much less look at the photos. The last 5 Farm Share deliveries were divvied up amongst my co-workers who were so excited to receive farm-fresh organic vegetables they never even questioned why I didn’t want them. Which is good, because I wasn’t prepared to tell them my news yet. My appetite is slowly coming ’round although it still isn’t what it used to be. I still can’t eat barbecue sauce and I still can’t bear to smell curry. But, I can eat *most* vegetables now. My husband and I did not take many photos of food these past 6 weeks because I’m not a fan of torture, but here is an interesting vegetable that I wanted to show you. 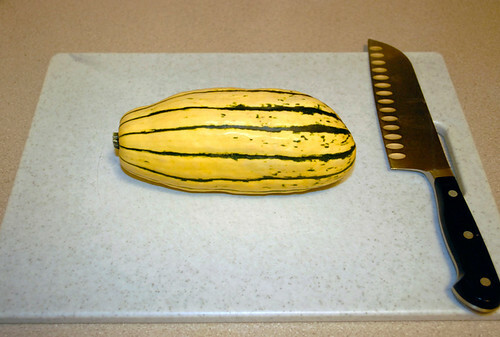 This is a Delicata Squash. 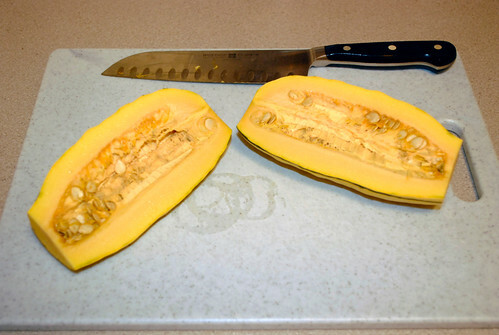 It is an heirloom variety of winter squash that we received through Farm Share. It has a delicious, mildly sweet and nutty flavor and a creamy smooth texture when baked. I simply sliced it in half length-wise, seeded it, put it in a baking dish, salt and peppered it, put a couple of dabs of butter in each half, put some water in the pan so it could cook gently, covered the pan with foil and baked it til very, very tender. Then I put more butter on each half and ate the flesh right out of the skins. Yum! I do enjoy squash! Especially when it’s double-buttered! I’m sorry you were so sick, especially for your favorites – I know how rough that can be. Here’s to a healthy and happy remainder to your pregnancy and a supremely beautiful baby!